Governor Charlie Baker signed a new law Thursday that could affect virtually every resident of Massachusetts, a week after lawmakers settled months of negotiations over proposed ballot questions that could have had dramatic consequences for the state’s finances and economy. 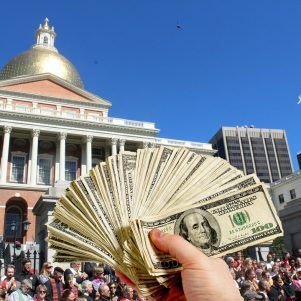 Legislators scrambled to assemble the so-called grand bargain bill after interest groups, fed up with inaction on Beacon Hill, initiated ballot drives and forced legislative leaders to engage with them at the negotiating table, or risk having major policies written into law by voters. Under the law, the hourly minimum wage will rise from $11 to $15 over a five-year period. During those same five years, time-and-a-half pay for workers on Sundays and holidays will be phased out. An $800 million paid family and medical leave program overseen by the state government and backed by a payroll tax will be launched so workers can more easily take care of themselves and their families without facing fiscal crises. 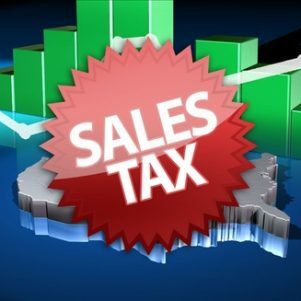 And every August beginning in 2019, the state will suspend the 6.25 percent sales tax on many purchases for a weekend. Baker signed the historic wage and benefits legislation into law in his ceremonial office, flanked by House Speaker Robert DeLeo, Senate President Harriette Chandler, and other legislators. “That one’s a done deal,” Baker said at 10:36 a.m. after his signature was on the law. The governor used several pens to sign his name and distributed each to the lawmakers standing behind him. The ceremonial office was packed with reporters, cameras, aides to the governor, and staffers from various legislative offices. The governor was largely a bystander in the negotiations and declined to stake out positions on the issues while encouraging legislators to work on alternatives to the ballot questions. By signing the bill into law, Baker registered his support for its contents. 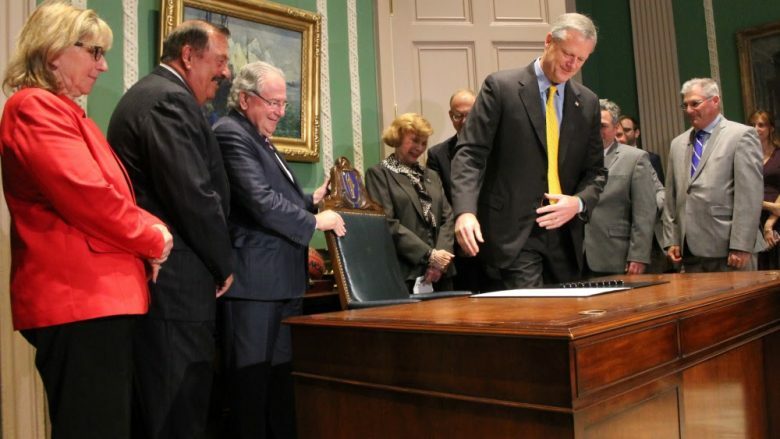 “The product of this is a far better product for the commonwealth than each of these as standalone entities would have been for Massachusetts, which is why I’m signing it,” Baker said Thursday. The Republican governor, who is up for reelection this fall, has repeatedly voiced a general opposition to broad-based tax increases but in signing the compromise bill Thursday he gave the green light to a new payroll tax expected to pull in about $800 million. “I guess the way I think about this is there’s a benefit that’s attached to this thing, and that benefit is a paid family leave provision that did not previously exist in state law,” Baker said Monday when asked if a no-new-taxes stance would prevent him from signing the bill. The one issue involved in the negotiations that Baker did publicly support was a reduction in the state sales tax. The Retailers Association of Massachusetts proposed a ballot question cutting the tax rate from 6.25 percent to 5 percent. Baker at the Republican convention in late April touted his support for a sales tax reduction, saying his opponents are against it, but he has not proposed a sales tax cut on Beacon Hill and it’s not clear how he plans to achieve it now that the grand bargain, which keeps the sales tax at 6.25 percent, has been signed into law and retailers have committed to dropping their popular tax relief question after scoring concessions on premium pay and a sales tax holiday. Baker did not take questions from the press at Thursday’s bill signing, or make comments about the policy implications of the far-reaching legislation. “The Massachusetts workforce continues to grow with more and more people finding jobs and our administration is committed to maintaining the Commonwealth’s competitive economic environment,” the governor said in a press release after the signing ceremony. The Raise Up coalition, the amalgamation of more than 100 labor, community and faith-based groups behind the minimum wage and paid-leave ballot questions, celebrated the bill becoming law Thursday and shared reactions from workers who will benefit from the new law. “For the past five years, my coworkers and I have been fighting for higher wages and it is just amazing that we have finally won! 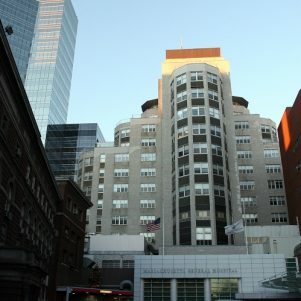 Winning $15 will make it easier for me to pay my bills and buy food each month,” Dayail Gethers, a wheelchair attendant at Logan Airport, said in a statement. The Raise Up coalition voted last week to drop its paid family and medical leave ballot proposal but waited until Tuesday to make a determination about its minimum wage question. The group confirmed Thursday that since the governor signed the bill it will not submit the signatures necessary to put the questions on the ballot. In agreeing to the compromise, the coalition passed on bringing its version of the minimum wage increase bill to the voters. 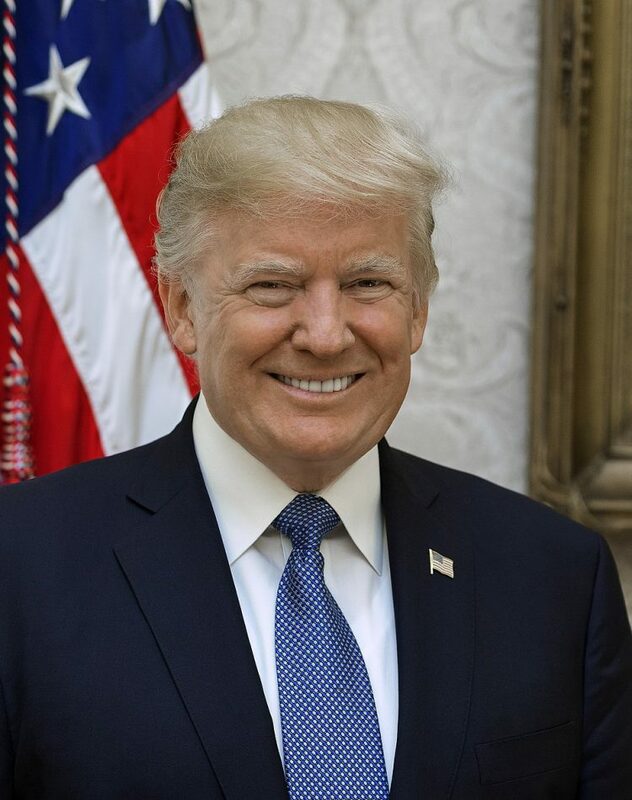 Had the question gone to the ballot and won, Raise Up could have celebrated securing a hike to $15 per hour in four years rather than five and would have ensured that the minimum wage was annually indexed to inflation. With the three ballot questions wrapped in the grand bargain now off the November ballot, voters will be left to decide questions imposing nurse staffing mandates at hospitals and rolling back the state’s new law aimed at preventing discrimination against transgender individuals in public accommodations. 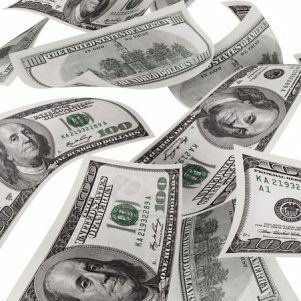 Combined with the Massachusetts Supreme Judicial Court’s rejection of the proposed income surtax ballot question, it also means that Baker’s reelection effort will not contend with a wave of progressive voters eager to vote on the so-called millionaire’s tax, a paid family and medical leave program, and an increase in the minimum wage. David Maher, president and CEO of the Cambridge Chamber of Commerce, said the grand bargain should be the model for how businesses, legislators, and advocates can work together to tackle some of the state’s most pressing challenges. “This new law will bolster the Commonwealth’s ability to attract world-class talent and innovative companies, without decimating budget funds we rely on to fund our schools and transportation system. It’s a compromise that works for Massachusetts, and one we hope can be replicated as we tackle future challenges on housing, education and public transit,” he said. Thursday’s signing of the grand bargain further establishes Raise Up as a force on Beacon Hill, having successfully fought for the last minimum wage increase, an earned sick time ballot law, and now having secured another minimum wage increase and the establishment of the paid leave program. In a statement Wednesday, the coalition pledged to continue to fight on behalf of workers “who were left behind by the Legislature in this bill,” possibly hinting at its next effort. Shortly after Baker signed the bill, Lew Finfer, one of the leaders of the Raise Up coalition, notified reporters that Baker has “stepped in with state funds” to extend emergency housing for a month to more than 300 Puerto Rican families who are in Massachusetts as evacuees from the hurricane in Puerto Rico. Saying the Federal Emergency Management Agency had refused to extend emergency housing assistance beyond June 30, Finfer said the families are staying in motels in Springfield, Holyoke, West Springfield, Worcester, Lawrence and Dedham.